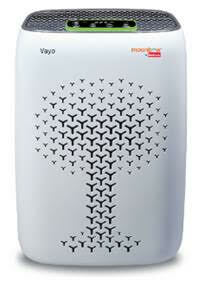 Expanding its existing line-up of Moonbow by Hindware air purifiers, HSIL today launched VAYO air purifier. The sleek and elegant new air purifier is equipped with a PURI 5 technology, a 5 stage filtration system which purifies particles as small as 0.3 micron in size such as fine dust, smoke, bacteria, pollen and mould spores and its pre-filter traps large particles like human hair, pet dander and dust and also has a high grade True HEPA filter (HEPA 13) which filters 8 times smaller particle than PM 2.5 with 99.5% efficiency to ensure clean breathable air. Its activated Carbon Filter neutralises odours such as smoke, harmful gases and Volatile Organic Compounds (VOCs) and a formaldehyde filter and refreshing energizers releases more than 8 million negative ions for improved indoor air quality.